Miami Stainless presents a useful guide to choosing between Mirror Polish and Satin Finish stainless steel for balustrade systems. Stainless steel wire balustrade systems add a striking contemporary design to stairways as well as swimming pools and balconies. But buyers are often intimidated by the many different finishes available and may even end up choosing the wrong finish for their application. All the stainless steel finishes available from Miami Stainless meet high standards of quality and durability, offering property owners years of use and enjoyment. At the end of the day, choosing between the two finishes is really just a matter of personal tastes and preferences. 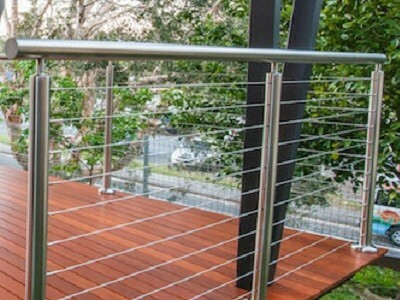 In this article, Miami Stainless takes a closer look at two particularly popular finishes – mirror polished and satin – and lists out a few distinctions between the two options that should be taken into account when buying balustrade posts and handrails. One of the most sought-after types of material for homes and commercial spaces, stainless steel is a highly durable metal protected by a chromium oxide film that is produced when oxygen in the atmosphere reacts with chromium in the steel. The attractive finish of stainless steel maintains its lustre and appearance for an exceptionally long time. Resistance to corrosion makes stainless steel a particularly good option for outdoor spaces that are exposed to the elements. The chromium in the stainless steel will react with more oxygen in the atmosphere when the surface is damaged, essentially repairing and restoring the surface to its original appearance. The longevity and strong aesthetic appeal of stainless steel makes the material one of the best options in the market for balustrades and handrails. Miami Stainless lists out the pros and cons of the two choices, mirror polished finish and satin finish, to assist buyers with their decision. Polishing of any type improves the texture, appearance and consistency of stainless steel. A mirror polish finish is achieved by pre-grinding the metal to remove surface defects, and then bright-buffing the metal to a smooth, reflective finish. Mirror polish stainless steel balustrades are particularly good for outdoor applications because of the ease of maintenance. The smooth surface allows dust, dirt and grit to be easily wiped off with a clean cloth. The only downside is that smooth surfaces such as mirror polish finishes will easily show marks and fingerprints, especially in areas that see a lot of traffic, necessitating frequent cleaning. A satin finish is achieved by polishing the metal’s surface with a 120-180 grit belt before it is softened with a lower-grit greaseless compound or abrasive pad. Though they may lack the brilliant sheen of a mirror polish finish, satin finish stainless steel balustrades have a high aesthetic value, especially for their silky matte finish without any clear grit lines or grinding scores. Since the surface is not reflective, a satin finish stainless steel balustrade requires less maintenance with small amounts of dirt or oil largely remaining invisible. However, being slightly rough in texture, the small grooves in satin finish could trap tiny particles of dust, dirt and salt, especially in coastal and outdoor environments, resulting in deterioration. Image: Polishing of any type improves the texture, appearance and consistency of stainless steel.